Only two Striders made the short journey to Gaddesby for this year’s very chilly Gaddesby Gallop, which was attended by some 153 runners. The 5.3 mile cross county course, though predominantly flat, required you to negotiate a number of obstacles including stiles, a waist deep pond, a drainage pipe, a stream and some very boggy fields. The first Strider home in 41 minutes dead was Simon Bottrill (22nd) followed by Jim Hatherley (36th), in an impressive 42.49 after having turned up over 5 minutes late for the start. Striders were out in force at last weekend’s Turkey Trot half marathon, with 11 Striders taking on the undulating course around the roads of South Nottinghamshire. Following their awards earlier in the weekend for male runner of the year and female runner of the year, respectively, Jason Barton led home the Striders in 1.21.52 and Abi Arnott had a good run to finish in 1.46.30. Shane Sharkey (1.33.20), Rich Gray (1.37.30), Simon Bottrill (1.41.38), Rob Beers (representing his first claim club of Barrow in 1.37.38), Michael Atton (1.40.29), Jenni Wisher (1.44.11), Ben Pickard (1.45.35), Vicki Lowe (1.47.29) and Susan Pettingill (2.14.38) completed the Striders team. 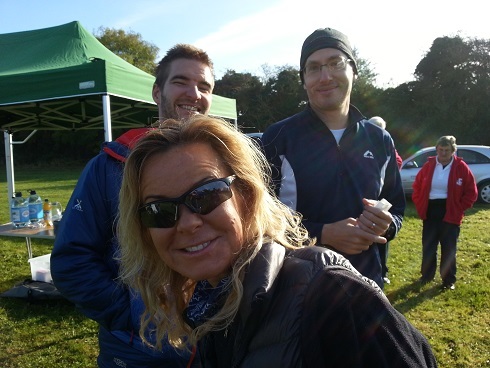 Thanks also to Gemma, Greg and Diane who all showed their support out on the course. It was the second in the four race series around Victoria Park in Leicester on Wednesday evening. 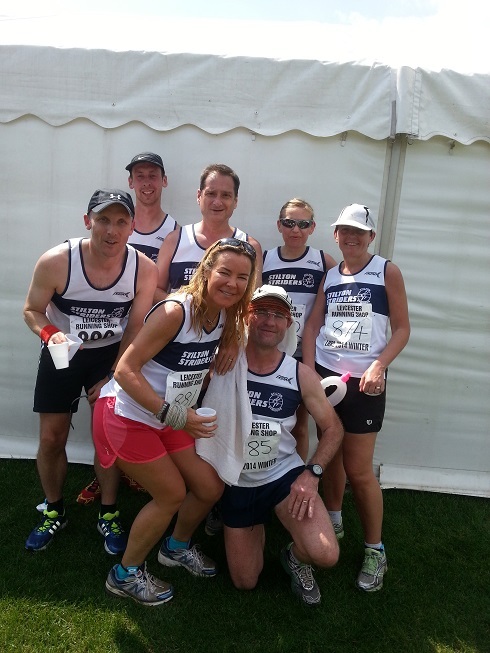 Wanting to maintain their good form from the first race, the Stilton Striders team did not disappoint. Five Striders were at Beacon Hill for the trail half marathon and on a cool, cloudy and later foggy day Mike Bryan was first home, in 16th place overall, in 1.38. He was followed by John Houghton (1.58), Louise Houghton (2.08), Steve Boylan (2.19) and Stuart Gregory (running his second half marathon of the weekend) in 2.28. 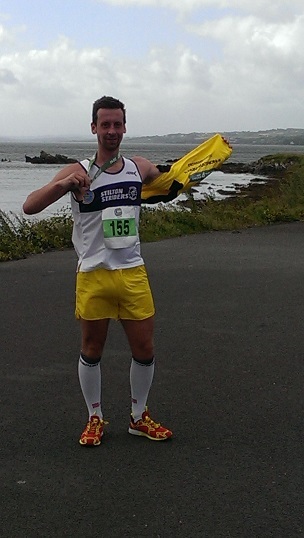 Jason Barton completed a successful week by taking overall victory in the 10k race at the Stilton Stumble in 36.19. This scenic (well, it would have been without the fog), flat rural race is going from strength to strength with the 300 places in the 10k selling out in advance of race day. 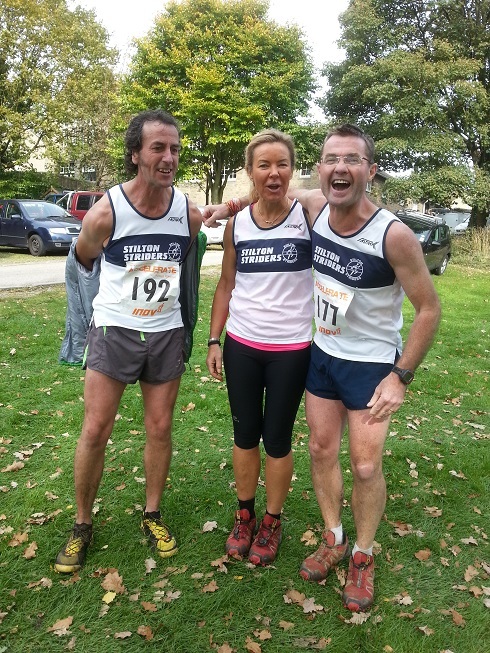 Three Striders competed in the longer 24k race, with Shane Sharkey leading them home, followed by Rich Gray and Vicki Lowe. With all injuries behind him, Wayne Hackett was at last able to carry on where he hoped to start about a year ago, racing under the name of his triathlon club, Belvoir Tri. Box Hill, Surrey, which was used by Mark Cavendish in the 2012 Olympic Games, was the destination for the Ballbuster Duathlon. The race was an 8 mile run, 24 miles on the bike and a final 8 mile run – all of which was on an 8 mile loop so included the ascent of Box Hill 5 times. 536 souls entered this year’s Wolds Challenge, 16 miles of trails among some of the best of the beautiful rolling Leicestershire countryside following the Wreake Valley, passing by the villages of Ratcliffe-on-the Wreake, Rearsby, Hoby, Shoby, Ragdale and Six Hills. The event was devised to encourage exploration of the rolling countryside around Seagrave, to raise money to help towards the refurbishment upkeep of Seagrave Memorial Hall and to support other good causes. Eight brave Striders stood together and shivered on the start line, the sun was out, it was a dry but chilly wind, scudding clouds threatened to bring worse as we all pondered over our kit selection. With a new and slightly longer course to celebrate the race’s 10th birthday a town crier set us on our way, within minute’s the sun lost the battle with the grey cloud, it started raining, the chill wind whipping up, resolve was called upon to tackle the muddy, wet miles that lay ahead. First lady strider Abi Arnott crossed the line in a very strong 2.30.59 continuing her excellent running year, Vicky Lowe put in a very respectable 2.31.02 despite recovering from flu, Louise Houghton finished of an impressive performance from the Striders recording a 2.42.48. Another well participated weekend of running as the Stilton Striders were out in force at the Shepshed 7 and Dovedale Dash. The 7 mile two lap course from Shepshed community college was a really enjoyable race this year as the weather yielded near perfect running conditions for the seven Striders that took it on. First home, and 13th overall was Jason Barton narrowly missing out on his Gold Standard with a time of 41.48. Next back was Luke Eggleston still running strong, finishing in 52.01 only just ahead of Gary Postle – a rare outing finishing in 52.16. Next home was Shane Sharkey closely followed by Abi Arnott in times of 55.47 and 55.48 respectively. Vicki Lowe completed in 1.00.26 and Stuart Gregory ran a course personal best in 1.07.04. Four Striders made the trip up to Dovedale for the 4.7 cross country race known for its fast downhill start followed by its iconic river crossing. Simon Bottrill was first round completing in 36.30. John Houghton (41.51) finished ahead of Steve Boylan (47.32) and Louise Houghton (1.01.20). 5. It was bloody warm! I assumed that not many people would actually be in costume as it was only an “optional” suggestion and not a race requirement. Bearing this in mind, I decided against my idea of running as Chucky (in jeans and a Striders vest instead of the traditional dungarees), and opted for my vest and shorts – far more suited to the conditions. Also knowing the terrain around Beacon Hill and that this was an off-road race, I opted for my Walsh Fell shoes. When I got there, I quickly realised that I was the ONLY runner not in at least partial costume, and once the race had begun I found that it was entirely on paths that run through the woodlands surrounding Beacon Hill. I had massively messed up each and every one of my wardrobe decisions. Luckily I had a headtorch! The run was one of the more enjoyable races that I have done and found that the last mile (downhill) involved me and some lad dressed as a Giant Mouse switching and swapping race positions as we figuratively played a game of cat and….. well….. you can probably see where this is going. Another local race saw a large amount of entrants representing the ever growing running community in Melton as 12 Stilton Striders, 3 members of the Melton Running Club and 2 other local runners took part in the Leicester Marathon and Half Marathon event on Sunday. Under near-perfect running conditions there was a fierce battle going on for first Meltonian home over the half marathon distance as the two quickest Striders went head-to-head for the first time – both recording Personal Best times. On this occasion Jim Hatherley was the victor in an impressive 1.20.13, only 9 seconds ahead of Jason Barton in 1.20.22 – the runners finishing 11th and 12th overall. Mark Stonely was the next Strider to finish, also in a PB of 1.33.39 ahead of debutante Luke Eggleston (1.40.11), Michael Atton registering a 1.41.26 PB and Michael Cooke (1.45.14). Louise Houghton was the first female runner back in 1.51.53 narrowly beating Helen Plant in 1.52.42 (PB). Also representing the Striders were Andy Robinson (2.05.10), Alison Wilson (2.13.15), Shaun Staff (2.16.08) and debutante Wendy Piesley (2.23.56). Representing Melton Running Club in the Half Marathon event was Sarah Lawrence (2.10.04), Diane Atton (2.18.50 PB) and Helen Cooke (2.34.46). Conor Savage from Melton Council recorded a time of 2 hours exactly, while an injured Laura Pickard made it round in 2.28.36. Jason Barton and Shane Sharkey were the only two Striders to venture to the West Midlands flagship running event – The Great Birmingham Run Half Marathon. With both runners using the run as a training step towards more significant runs next weekend, they both set relatively conservative targets. Eight Striders.. yes that’s right, eight! Met at Eaton country park to take on the fourth Eaton Stampede a challenging 10km cross country race on trail, field and mud with fell like ascents raising money for Dove Hospice and Eaton Community Park. The Striders team bunched at the front of the start line jostling for position, eyeing up their Garmin’s, Louise eyeing up whether John’s lunch box was in range for a quick tweak. The sun burnt away the last of the cold fog as a shout from a marshal signalled the start of the race. Mike lead the Stilton charge despite a persistent (and frankly annoying) loud cough, closely followed by Andrew despite encumbered with heavy bandaging from Wednesday nights out run (another story). Seven Striders made it into the top ten finishers, first home in an excellent 2nd place was Mike Bryan 44.26 (despite a major beer festival hangover) followed by Andrew Bentley 47.24 in a well-deserved 4th place (despite outrun injury’s) then Luke Eggleston in an amazing 5th position, (getting faster and faster) 48.37, in 6th place was John Houghton in 48.44 in what can only be described as the sprint finish of the year (it really was) very closely followed by Michael Cooke 48.46 in 7th, then a disgruntled looking Stephen Boylan (pronounced Boooolan) in 8th in a time of 48.48, on his heels Richard Gray in 9th position in 49 mins (Equinox solo hangover). C’mon c’mon baby do the Curbar loco-motion with me! 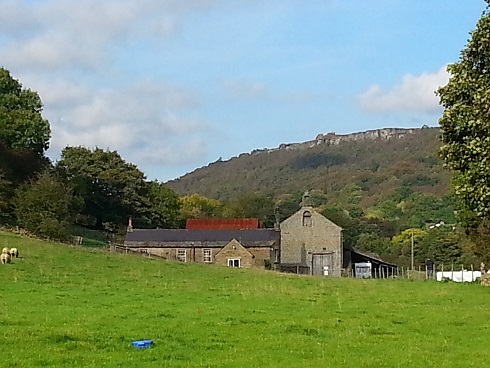 Start and finish from Cliff College, Calver. 230 runners. Curbar Commotion, the fell race, 9 miles, 1650 feet of ascent.. three Striders crouched liked coiled springs at the start line of what was clearly the first day of autumn (it was very cold).. John cracked a hilarious joke (I thought it was funny) only to be met with a sharp twist of his left scrotum from the hand of wife Louise (pretty sure it was Louise) Steve was mumbling something about running as a team..? The gun went and Steve disappeared in a frantic charge followed closely by Louise and then John, once he’d made a few.. ahem.. adjustments. Up up we went.. and up again. Once on the top, the best of the Peak district lay before us as far as the eye could see.. Baslow Edge, Curbar Edge, Froggett Edge and on.. The weather was probably more suited to spectators than the runners as a plethora of Meltonian runners, including three Stilton Striders, took to the streets of Nottingham on Sunday morning to take part in the Ikano Robin Hood Half Marathon. Duncan Greene was first Strider home in a fantastic time debut Half Marathon time of 1.25.39, followed by Shane Sharkey in 1.36.34 and Stuart Gregory secured another personal best for distance as he completed in 2.07.55. Richard Angrave, representing his first claim club of Wymeswold, completed the course in 2.16.14. 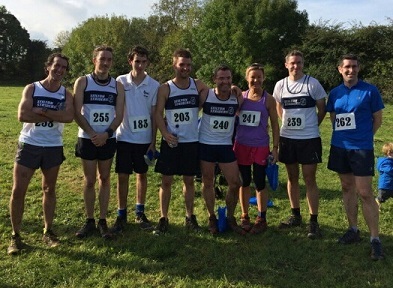 Well done to them all, and also the other Melton runners including the other debutants from Rob’s beginners group – full details in the Melton Times article linked below. 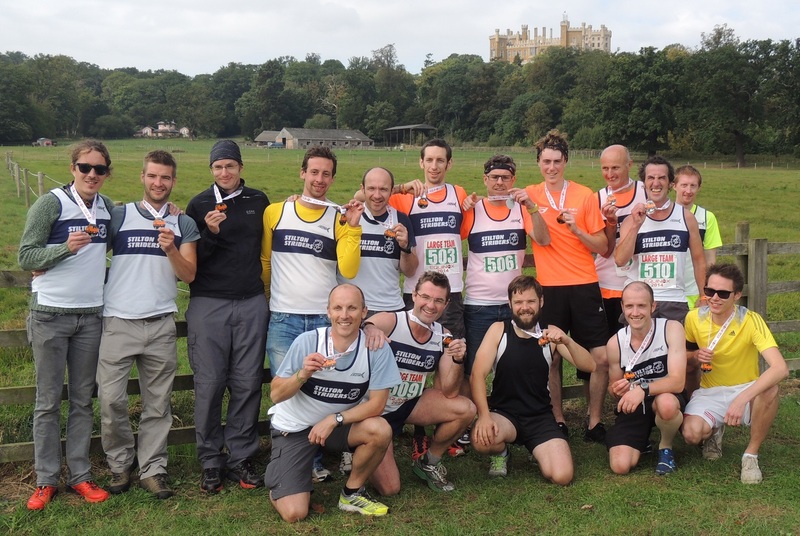 Belvoir Castle was the venue for the second running of the Equinox 24hr 10km relay race. 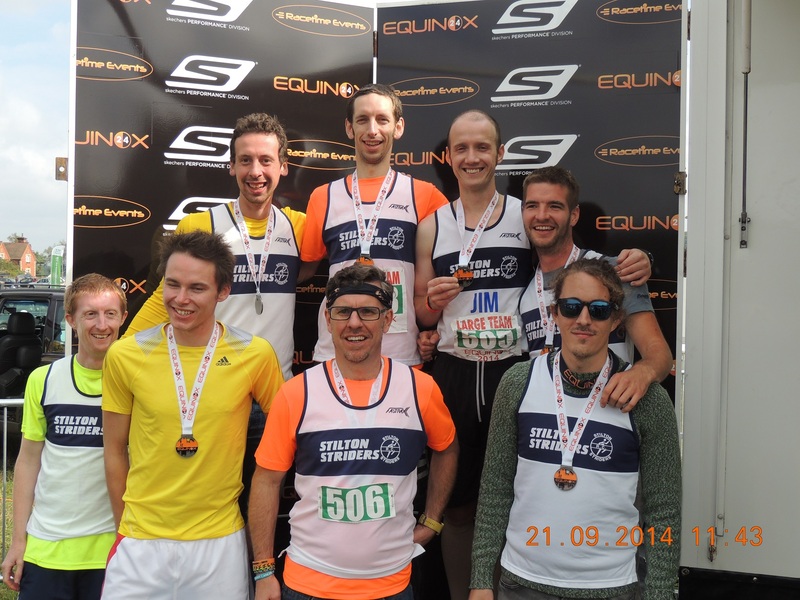 Stilton Striders decided to enter two teams in the 6-8 category and went one step further than last year with Striders Team A, coming out winners of the whole event! The winning team was made up of Mike Bryan, Shane Sharkey, Jay Barton, Simon Bottrill, Jim Hatherley, Duncan Greene, Andrew Easom-Bentley and Ian Johnson. Team B also did extremely well, managing 28 laps, made up of Mike Brighty, Ian Mason, John Houghton, Steve Boylan, Evan Larke, Shane Durrance and Wayne Hackett. Coming in 12th out of 45 large teams, this was another impressive performance. Stuart Gregory was the only Strider to make his way down to East Sussex for the first two events in the Spartan race UK series. with Stuart entered in the early afternoon heats ground conditions were horrible and with a shoe misjudgement this made things worse as less than half way into the very challenging 4.5 mile sprint race thing became very slippery for the rest of the race, as Stuart completed the first race of the weekend in 1hr 44m 53s. ‘Part of the World’s oldest sheepdog trials.. pay to enter, run for nowt, real ale..’.. the Longshaw sheep dog trials fell race .. 6 miles 1000ft.. mud.. lots and lots of mud!.. stupidly steep terrain over Burbage, Higger Tor, Owler Tor including woods, rocky paths and the occasional bog! As part of the Bank Holiday Monday festivities at Old Dalby Day, eight Stilton Striders took on the infamous Old Dalby Hill Race. The charity race takes runners over 4.5 miles of hilly mixed terrain including road, gravel tracks, forest trails, fields and mud, with the rain adding considerably to the overall experience. The Donegal Quadrathon is a “4 marathons in 4 days” event around Co. Donegal in Ireland. As the final day of this coincided with the dates of my holiday in the county, I decided it would be rude of me to not take part in at least a half marathon on the final day, running from Bridgend through Muff and on to Redcastle close to the Northern Irish border. A team of 13 runners from Stilton Striders took part in the annual 3 Club Challenge, an annual fixture involving Stilton Striders, Wreake Runners and Barrow Runners. Run this year over a 5 mile multi-terrain route from Beedles Lake Golf Club, East Goscote, this event which has a heavy emphasis on participation as well as some competition against local clubs attracted 95 runners in total. The team scoring system led to a victory for Barrow. Jason Barton, Ben Pickard, Rich Gray, Laura Pickard, Gemma Brown, Gary Postle, Joe Postle, John Houghton, Vicki Lowe, Harvey Hopwood, Stuart Gregory, Rob Szabo and Steve McGarry all ran well and were supported by Shane and Mike who came along to offer their support (whilst nursing their injuries…) and a guest appearance from John Stares in a supporting role. A great night, as ever, and its our turn to host in 2015…. Eight Stilton Strider vests were on show in Huncote on Wednesday night as their respective wearers took part in the year’s penultimate league race, the Joy Cann 5. The first Strider home was Shane Sharkey narrowly missing out on a personal best in 32.53. Richard Gray was second in with a time of 33.51 very closely followed by Simon Bottrill (33.57) and Ben Pickard, who took a massive two and a half minutes off his previous best with a time of 34.26. The annual Jagermeister 10K attracted 376 finishers on Friday 1st August on a hilly course within the grounds of Nottingham University . 10 minutes before the 7pm start of the race the rain came down and caused all those competing to race for cover. The first half of the race was endured through rain and the course was covered in puddles making r unning a difficult proposition. Nevertheless such is the spirit of runners and the fun of this race that no spirits were dampened and a great night was had by all rounded off with a burger and chips and a couple of pints at the University Sports and Social Club. Richard Angrave was the only Stilton Strider running and in his fourth time competing in this event broke the hour for the first time with a course best of 59:28 to finish 306th out of 376. There are some amazing spot prizes and with four of the Wymeswold team winning a jacket, bottle of Jagermeister (35%), and two winning cocktails and glasses between them. Wednesday evening saw 190 runners take to the Victoria Embankment in Nottingham for the Annual Notts 5. A scattering of trees and light summer breeze afforded the only shelter to the runners on the five mile route; including sole Strider Shane Sharkey. The conditions definitely slowed up what is usually considered a PB course, and Shane finished in a pleasing time of 33.10. An early 10am start for the Long Eaton 5 mile race but still a warm humid morning for around 200 competitors. On Sunday, it was the turn of Hermitage Harriers to stage the 5th of the summer Leicestershire Road Running League Races and the weather held up nicely to provide good running conditions. The course however, could not be described as having PB potential as 405 runners endured 381 feet of ascent over the 10k route. As the Leicestershire schools were breaking up for there summer holidays, a group of running enthusiasts comprising of members of the Stilton Striders, parents of junior striders, juniors and some newby runners from the Melton Running Club Monday night beginners group descended on Saffron Lane Running Track to compete in the 100 Lap Challenge under the Striders name. 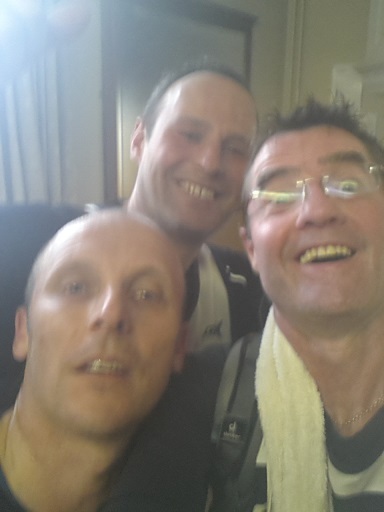 The team completed the 100 laps in a very respectable time of 2hrs 19mins 54secs, coming 4th out a total of 9 teams. The team comprising of: Chris Southam, Jasmin Southam, Matt Atterbury, Richard Gray, Darryl Schoffield, Shane Sharkey, Jay Barton, Lucy Underwood, Ben Pickard, Mandy Stace, Ian Johnson, Wendy Piesley, Ian Mason, Laura Pickard, Andrew Easom-Bentley, Mike Bryan, Oliver Hall Stace, Katie Morley Stace, Ann Thomas, Diane Atton and Lily-Mae Hackett. Organiser Wayne Hackett. 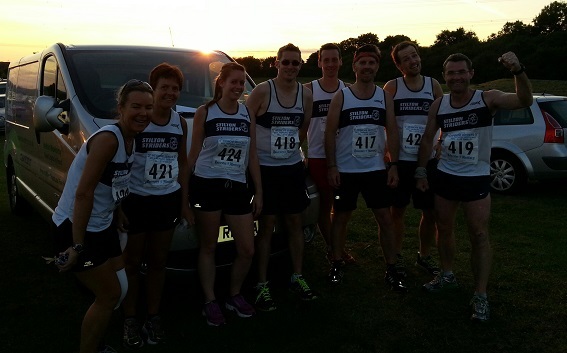 Wednesday evening saw the third Leicestershire Road Running League summer race, set in the village of Hungarton. 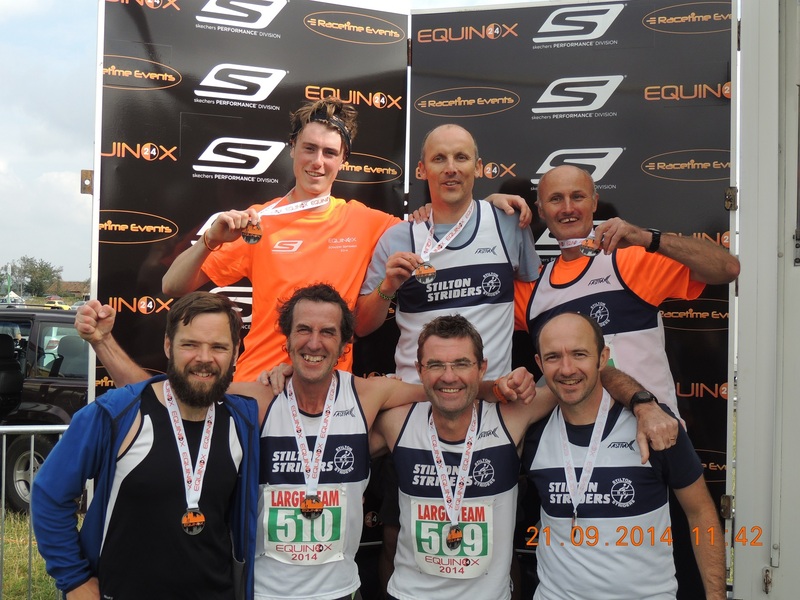 Despite being known as one of the toughest races in Leicestershire, a team of 12 Stilton Striders were among the 424 runners to tackle the notoriously hilly terrain. The third race in the Holme Pierrepont Grand Prix was a 5k route around the scenic grounds of Wollaton Park in Nottingham and featured a surprisingly tame herd of deer at the start. The undulating multi-terrain eveng attracted 301 runners, including three Stilton Striders. After Friday night’s trip to Beacon Hill, Striders’ Stuart Gregory headed off for a weekend’s running in the peak district. Saturday morning saw the start of a 31 mile ultra race across the high peaks things started well with good progress being made to mile seven in 1hr 43m, having joined another runner at check point one the pace improved slightly to check point three and four, unfortunately by this point the pace had slowed slightly as the profile of the course became more hilly and with the monster of win hill coming into sight it was time to save some energy for the hard climb ahead. win hill marked the start of three big climbs and it took 44 minutes to complete the one and a bit mile long 1 in 3 accent, this marks the half way point on the route and the going was all but down hill to the feed station at Bradwell sports centre, where a top up on water and food was always a welcome sight. and so if was off again to the next climb at Bradwell hill a one mile 1 in 4 accent and at 19 miles is nearly two thirds of the way around, a pleasing sight as check points eight and nine Derwent bridge and river came into view as this section is a lot flatter and marks the beginning of the end with only one big climb of 2 miles remaining this took quite a while as by 24 miles the legs had started to give in, finally as check point ten came and passed the person I had been running with legged it, it took a pain staking 40 plus minutes to walk the remaining 1.3 miles very very slowly, to finish in a time of 10:26:28, to finish 43rd in the senior male category and 102 overall, the person I had been running with finished 27 minutes ahead of me after running into the finish to beat her target of under ten hours. John Houghton narrowly beat Vicki Lowe for the title of “first Strider home” in this 5-ish mile trail race, with both clocking 41.15 for the “undulating” course (see photographic evidence below). Max Houghton, in his first race, was next in 45.30, closely followed by Steve Boylan (45.59). Stuart Gregory, at the start of a long weekend, completed in 52.00. On a beautiful evening for spectating and enjoying the views at Rutland Water, Shane Sharkey, Mike Brighty and Vicki Lowe took the top 3 places at the annual club handicap race. Full report on the “Outrun” page. Four Striders took on this year’s race, a challenging undulating two lap course all on road. 472 runners took part in perfect running conditions, with a new start/finish this year in Rothley centre adding to the excellent race atmosphere, it felt like the entire population of the village cheered the runners home. One hundred runners descended on the village of Stathern for the annual Stathern 10k – this year raising money for Dove Cottage Hospices. 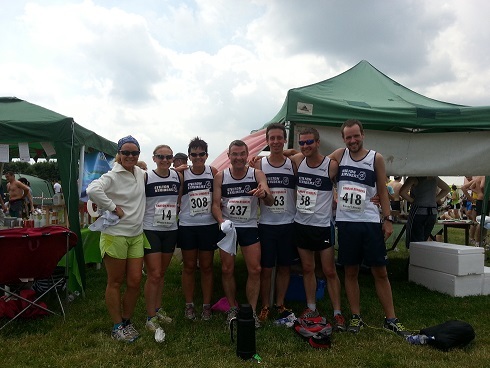 Known as a fast course, six Stilton Striders put in strong performances registering a Personal Best time each! Another league race, another blazing sunny day. 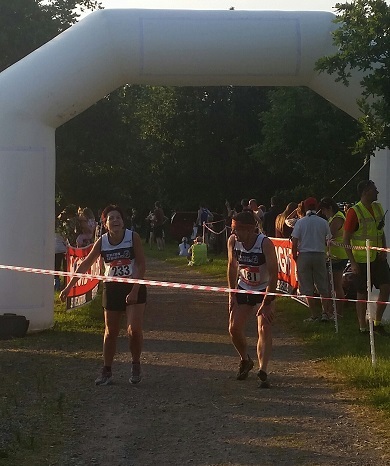 Nine Striders turned out in force to attempt the first of the Summer League races around the Swithland Reservoir – eight successfully (hope the injury heals soon, Louise!). Shane Sharkey was the first to complete the 6 mile undulating race in a time of 41.14, followed closely by Simon Bottrill on his race debut as a Strider who finished in 41.50. Nicholas Smith was next home in 45.52 with John Houghton in 46.34. Two Striders attended the Notts 10 mile race at Holme Pierrepont on Friday evening. A warm, still evening and the picturesque backdrop of the National Watersports Centre made for perfect running conditions. Superb turn out once again for the 7th edition of the now infamous Clawson 10k. Five Striders took on the gruelling steep off road route, driving heavy rain and strong winds added to the challenge. Sunday 11th May saw the Annual Wymeswold Waddle race attract 245 starters with three Stilton Striders at the start line. The race had a new Race Director this year, Niall Gardam who seamlessly organised another fantastic day for the village. Previous Waddles had all been organised by Chris Taylor, who actually took part in his first Waddle dressed as King Duck and despite injury and the weight of the suit still finished the five mile race in 39:52. With 4 races in 8 days, Stuart Gregory finished things off with a season’s best over the 13.1m distance at Bosworth on Sunday 11th May, completing the rather tough route in 2hr 29min 29sec. Stuart Gregory, making it 3 races in 4 days, ran at Croft Hill on 7th May and completed the 4.5 mile hill race in 49min 51sec. 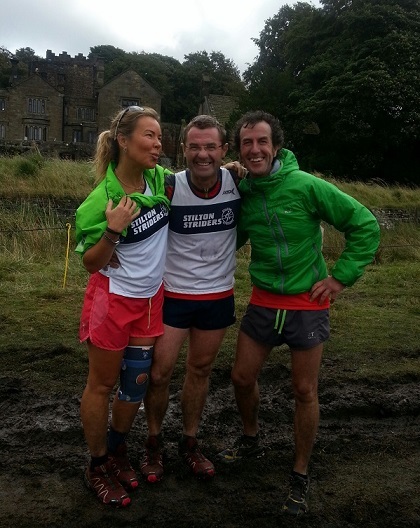 Stuart Gregory completed the course in 2hr 33min 06sec ahead of racing again the next day at Woodhouse. On Sunday, Shane Sharkey was the lone Strider at the Langtoft 10k, bearing the heat to take 3 minutes off his 10k personal best to record 43m 03s. Over the bank holiday weekend, 227 runners set off to race the 100 mile Thames Path from Richmond in West London to the finish in the grounds of Oxford University. With a 28 hour cut off, many would not make it (80 dropped out along the way or were beaten by the cut off). 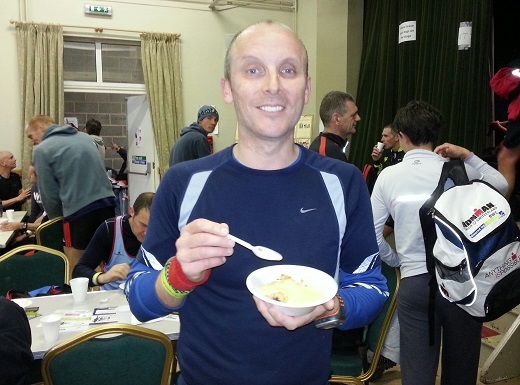 Among the finishers was Stilton Strider Richard Gray, who finished in 89th position in 24 hours 46 mins and 10 seconds. The sun shone brightly over the capital city for the 34th London Marathon on Sunday, but although this provided spectacular conditions for the millions of spectators, it made the course much tougher for the 36,000 runners. Three Stilton Striders took part in the race and, despite the 20° heat, all finished comfortably in the top quarter of the field. Mike Bryan was the first Strider home in his marathon debut in a time of 3.22.14. Jason Barton was next in in a time of 3.38.38 and Shane Sharkey with a time of 3.48.41. 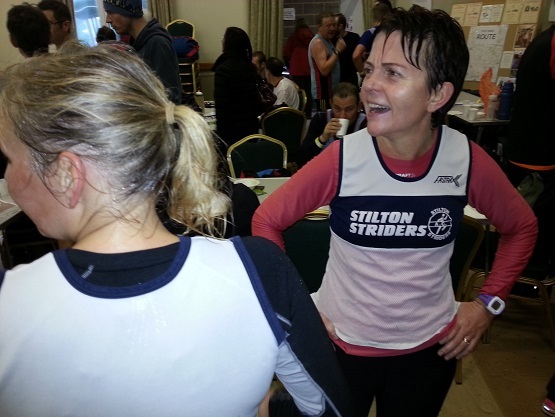 Another fantastic day’s racing for the Stilton Striders on Sunday, both locally and on the Streets of Manchester. 6 Striders took part in the Desford 6 mile league race and were led home by Jason Barton in a time of 37.32 and closely followed by Greg Petingill in 38.51. Next home was Shane Sharkey (41.03), Ben Pickard (43.46), John Houghton (46.00) and Ian Mason in 50.02. Shane and Jay were using this as a last warm up session before next week’s London Marathon where they will be joined by Mike Bryan. Vicki Lowe made the trip up to Manchester and put in a qualifying time for next year’s VLM by running the Manchester Marathon in a fantastic time of 03.49.05. Also in action were Gary and Joe Postle who were raced at the Derby 10km. They came home in 43:09 and 44:10 respectively. The Belvoir Half was subject to perfect running conditions on Sunday, and this showed as six out of seven Stilton Striders achieved new personal bests. Darren Glover was respectfully the first Strider home in 1.29.24 and then the personal records started falling. A successful day for the Striders was finished off over the fields surrounding Southwell where Rob Beers made 3rd place in the Half Tour and Rich Gray was 2nd in the Full Tour. A low key 31 mile or 16 mile event in its second year, this small but perfectly formed event is one to watch for next year, if numbers allow. 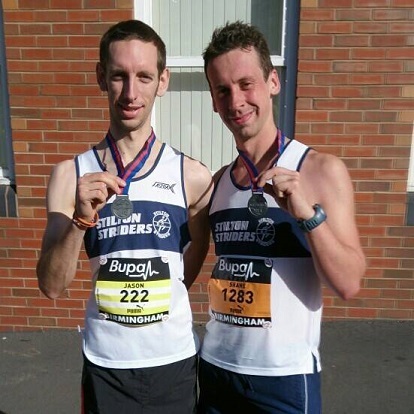 Two Striders made the trip to Loughborough for this year’s half marathon. Reuben Bradshaw finished in 2.06.33 and Stuart Gregory continued to improve upon his recent performances knocking 11 seconds per mile off his pace, finishing in 2.30.36. Sunday saw 355 people competing in the long awaited return from Stilton Striders RC in hosting a running race for the very unique Leicestershire Road Running League (LRRL). The Stilton 7 consisted of two laps starting and finishing near Holwell Works heading out towards the former Asfordby Mine Site, taking in the climb up past Welby Church, then down to the Valley and back up Asfordby Hill, before heading back round the loop again. On a warm morning, the first person to cross the finishing line representing Coalville based club Hermitage Harriers was Matt Adcock in magnificent time of 38mins 25seconds, with the first lady being Emily Ault of Barrow Runners in 44:44. 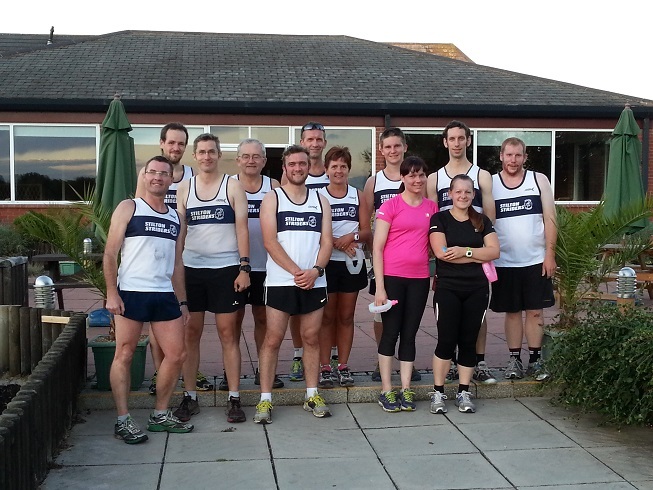 The Striders themselves had a contingent of 15 runners, heading the pack was Jason Barton who finished 25th in 44:06. Followed by Darren Glover(45:47), Greg Pettingill (46:12), Mike Bryan(47:42), Shane Sharkey(49:34), Andrew Easom Bentley (50:59), Iain Howe (52:13), John Houghton (54:48), Dan Valencia (55:04), Andy Nicholls (55:37), Abi Arnott (56:54), Ben Pickard (57:21), Vicki Lowe (57:48), Neil Jaggard (59:45) and Richard Angrave (67:20). Mud was the order of the day at this year’s Belvoir Challenge, with the very wet winter showing through in the footpaths. Conditions for the event, however, were ideal with a cold start giving way to sunshine and no wind. Drinks stops every 5 miles or so were well stocked with tea and cakes for runners, walkers (and the odd supporter). First Strider home in the marathon distance was Sam Spencer (in 4.12), followed by Rich Gray (4.30), John Houghton ( 4.44), Mike Brighty (5.08), Gary Christmas (5.24) and Louise Houghton (6.13). Making the most of the conditions in the ‘fun run’ (actually over 16 miles) was Mike Bryan, who finished in 6th place in 2.02, with Andrew Bentley (2.21) and Abi Arnott (2.52). Mike Brighty and Vicki Lowe were the only Stilton Striders to make the short trip to Stamford for the 21st annual running of the Stamford 30K on Sunday. The race is very popular with runners as part of their training towards spring marathons and the 750 places on offer are quickly snapped up. 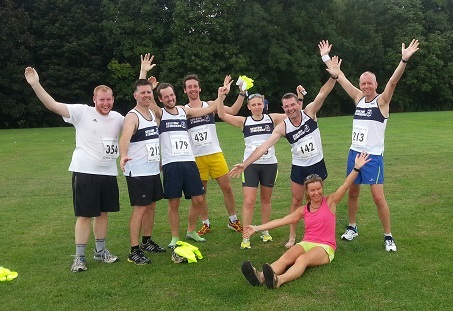 10 Striders made the annual trip to Markfield for the second league race of the season, the Markfield 10k. They joined 526 runners in battling strong winds and the undulating course that passes the picturesque Thornton Reservoir (as well as the not so picturesque M1 bridges). Jason Barton was first Strider home in 38.46, with Greg Pettingill and Mike Bryan not far behind in 40.44 and 41.01 respectively. The mens team was completed by Richard Gray (42.57), Andrew Bentley (43.50), Shane Sharkey (46.06), Ben Pickard (47.00) and Ian Mason (50.26). Stuart Gregory, in his first league race for the club, came home in 68.45. Louise Houghton was the ladies team, finishing in 48.41. The next league race is the Ashby 5 on February 23rd – would be great to see a full mens and ladies team out for this one! A group of Striders joined 382 runners at the Charnwood Hills race on Sunday 2 February 2014. This 14.5 mile race was a test of stamina following the recent wet weather with sloppy muddy conditions. The Charnwood Hills race is the only fell race held in Leicestershire over Bradgate, old John, Broombriggs and Beacon Hill and looking over beautiful scenery. Greg Pettingill had a brilliant race finishing in a time of 1.51.17 and coming 3rd in his VM50 age category. Vicki Lowe, 2.25.38 (finished 9th in VF45 Category) and Steve Dewick returning from time out from racing finished in 2.36.38 running for his fell club Dark Peak. Stuart Gregory, in his first event as a Strider, completed the course in 3.22. On Saturday, 9 juniors ran in the county cross country championships. The conditions were awful, with continual rain and the course becoming mud all the way round. However, these 9 brave little souls ran their hearts out. First up was Victoria Sercome in the U17 girls and finished an excellent 6th. The U13 girls saw Lucy Thomas finish 28th, sister Ella was 29th and with Mia Barlow finishing 34th this gave the team 5th overall which was an excellent result – particularly as all three are at the bottom of their age group. Luke Jane, running his first cross country of the season, finihed a creditable 8th in the U17 boys. Marcus Rowland and Tom Dryell ran in the U15 boys, finishing 9th and 10th. The last athletes to run were Edward Birch and Taylor Jordan in 14th and 15th respectively.